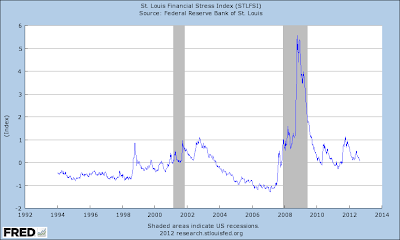 The St. Louis Financial Stress Index (explained here) has largely remained between 0 and 1 for the last couple of years, but has remained significantly higher than during the 2004 to 2007 period. But the last figure reported as of 24 August 2012 is 0.073, the lowest since end of July last year. The index was however lower than the current level in November 2007, so it should perhaps not be relied on as a predictive model. 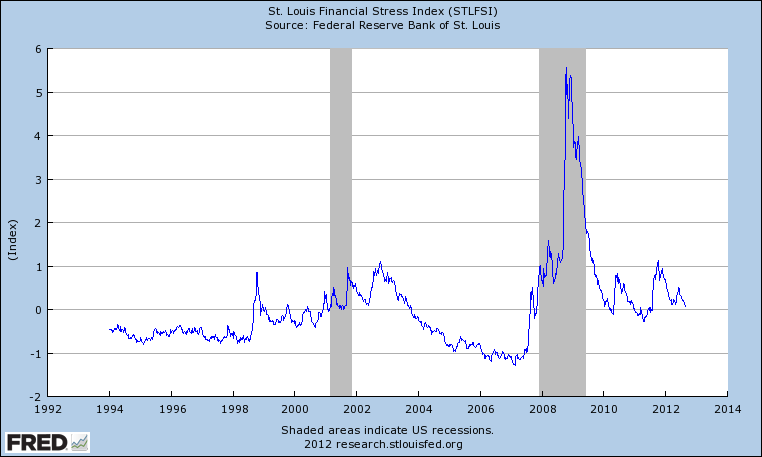 As the chart demonstrates, the higher the index the more financial stress. The index is constructed primarily using U.S. data, but a spike in the index will affect the rest of the world as well through contagion.